This post is by Dana Biermann, employee of The Salvation Army Midland Division in St. Louis and a lover of the Redbirds. Won a World Series two years ago… unlike some other teams we know. Wouldn’t it be embarrassing if we got swept by the Cubs this late in the season? Because we have the highest win percentage in baseball right now. We have Yadi, Carpenter, Waino. Not to mention the greatest (and most supportive) fans in major league baseball. So what if someone from Chicago were to throw out the first pitch at OUR GAME. What if a CUBS FAN got to showboat to the mound in front of 47,000 Cardinals devotees like he owned the place?? That is in danger of happening. On August 10, it is The Salvation Army’s Night at the Ballpark, and The Salvation Army of Chicago is battling us head on for the rights to throw out the first pitch. And who gets that throw is determined by YOU–us, or them. If you’re a Cubs fan (boo!) you text MYCUBS to 80888 to make a $10 donation to The Salvation Army in Chicago. But if you’re a CARDINALS FAN (cue musical flourish) text MYCARDS to 80888 to make a $10 donation to The Salvation Army that will stay right here in St. Louis. The most money raised will determine who throws out the first pitch. And since we’re at the height of hunger in our city and with our food pantries going bare, your text will give local, struggling families the support they need to survive, AND save our city from embarrassment. It’s a win-win, folks. Texting starts NOW and we have until August 8th to show Chicago who’s boss. Our thumbs are ready for a workout. Are yours? One year ago this week, a tornado changed the lives of thousands in Joplin, and thousands more who gave of their time and heart to work toward rebuilding. It was a wonderful experience this week to take a break from the work and reflect on how far the community has come. We continue to be a driving force in the recovery there daily. We hold this community in our hearts and prayers, and look forward to another year of even greater strides and impressive improvements. The Crossleys stand on their newly poured foundation, anticipating the day when they can move into their new home. Nearly one year after a historic tornado destroyed more than 7,500 homes and 500 businesses, Joplin residents are still finding their way back to normal. Crossley, a 15-year employee of The Salvation Army lost his home when it was badly damaged in the storm. Emerging from a closet where they’d taken shelter, the Crossley family found their roof partially gone, their windows broken, live power lines on their car and no immediate hope for assistance. In the days following the storm, he and his family slept at The Salvation Army Community and Worship Center, at friends’ houses and at a motel. Today, thanks to the aid of The Salvation Army, his church, family members and friends, Crossley and his family are hopeful their lives will return back to normal. “We just poured the foundation on a home we are building. We hope to move into it in early June,” he reports. 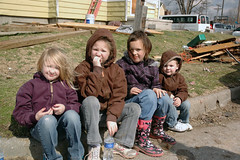 Residents of Joplin rebuilding after the storm. 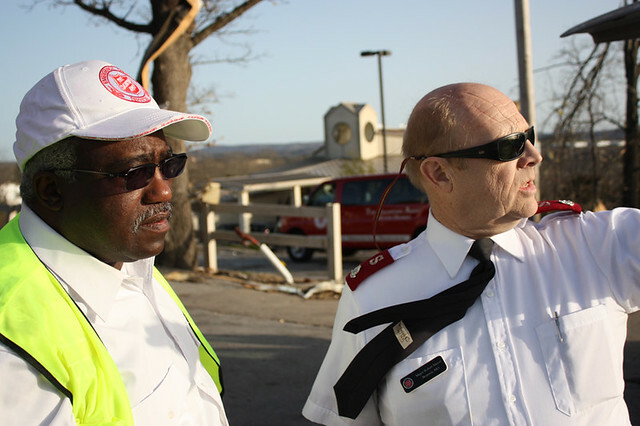 The Salvation Army was recently awarded a contract with Missouri that will allow it to continue long-term case management with residents through May 2013. In the coming weeks, long-term plans will be released detailing The Salvation Army’s strategy for long-term recovery and investment in Joplin. The Salvation Army continues to provided needed assistance to those in the Branson area that were affected by Wednesday’s damaging storms. A Salvation Army mobile feeding unit, or canteen, is currently stationed outside the Branson Mall and providing food, water and snacks to anyone in need. Emotional and spiritual counseling is also available. This canteen will remain at the Branson Mall until approximately 4:30 p.m. and then begin traveling throughout the Branson area providing services. Currently, trained Emergency Disaster Service volunteers are at the Branson Corps preparing tonight’s evening meal that will be distributed on the canteen. They are preparing enough meals to feed approximately 200-250 people. However, Incident Commander, Major Robert Meyer, said The Salvation Army is capable of preparing and serving many more meals if necessary. In fact, this particular canteen is capable of preparing and serving 150 meals an hour if need be. Tonight The Salvation Army plans to first provide canteen service to the residential areas near the Branson Corps, which were among some of the area’s hardest hit. Then the canteen will travel in a counterclockwise pattern around Branson beginning near Highways 76 and 65 delivering service directly to individuals. So far, The Salvation Army has provided assistance to nearly 400 individuals and will continue to provide assistance for as long as there is a need. Monetary donations are the most critically needed resource, as supplies and personnel are mobilized. 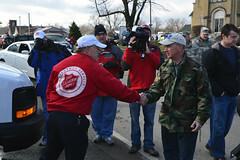 Help provide immediate assistance by calling 1-800-SAL-ARMY or by visiting http://www.STLSalvationArmy.org to make a secured credit card donation. Please mail checks to The Salvation Army, P.O. Box 21787 St. Louis MO 63109 – designate your gift by writing “Storm Relief” on the check. Mobile and Smartphone users can text the word ARCH to 80888 to make an instant $10 donation. Please remember that due to the high expense and amount of time associated with delivering in-kind gifts, such as gently-used household items and clothing, The Salvation Army cannot guarantee at this time that any individual donated gifts-in-kind will be sent to the disaster area. During times of disaster, The Salvation Army is able to meet the need for these items from its thrift store’s existing, pre-sorted stock. Therefore, by continuing to donate gently-used household goods to your local Salvation Army thrift store, you not only help your local community, you help The Salvation Army prepare for future disaster relief needs. To locate your nearest Salvation Army drop-off location, please visit http://www.satruck.org. The Salvation Army, an evangelical part of the universal Christian church, has been supporting those in need in His name without discrimination since 1865. Nearly 30 million Americans receive assistance from The Salvation Army each year through the broadest array of social services that range from providing food for the hungry, relief for disaster victims, assistance for the disabled, outreach to the elderly and ill, clothing and shelter to the homeless and opportunities for underprivileged children. About 82 cents of every dollar raised is used to support those services in nearly 5,000 communities nationwide. For more information, go to http://www.salvationarmyusa.org.